Yes this best 2017 cover letter format is all you need. Formatted for all occupations, our samples are free. So you might be asking yourself why do I need to know about a resume cover letter format. Well when you use a properly formatted cover letter, you are showing the employer not only are you interested in the job, but you also have a professional presence about you. With the great deal of cover letters they receive, quite often they are unruly in their information. Make sure to read further so you at the very least you have a great cover letter that represents you well. You need to do a great job writing you cover letter as it will help you stand out if done the right way. You will need to make yours very special. That is where we come in to help you by supplying you with the right format. 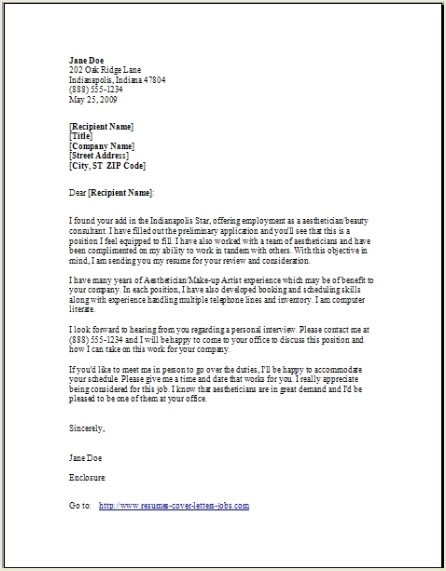 I will also give you an example of a pre filled resume cover letter format. The simple and most effective way for making sure you have a professional layout when creating your own cover letter. ...helping you through this process is what I do, free for our visitors. Beginning at the top left side of your letter, start with your name and your complete mailing address followed by your phone number; then you will want to space down twice, and then go ahead and type out your current date in a separate line. Next space down twice and add the recipient name, their title (if any), and their completed mailing address. When you are writing your greeting (Recipients Name), do try to keep it formal as this is the best policy. Don't think about using the person's first name. Instead, Ms., Mr., Dr. or whatever their professional title would be, or if military is involved use their rank along with the persons last name. If you absolutely cannot find out the persons name, then to Whom It May Concern would be your last resort. 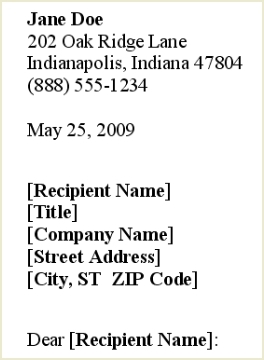 ....Using the proper format in your heading will get your letter to your intended recipient faster. You should start out by being very professional, and then state your business quickly and efficiently getting to the point. Quickly indicating to the person the job that you are applying for. 1. Your reason you are writing and which job you want to apply for. You should keep this quick, very simple but catchy. 3. Give any compelling reasons you have applied for the position or company. Keep it short and sweet, with the view to inspire the reader. If you would like to look at more cover letter samples where you can view the whole letter so you can dissect the paragraphs to see more of what we are talking about, then you might like to go ahead and visit our Cover Letter page to look at some more closely!! ... As Always, use every inch of this letter to get them to look at your resume. In this paragraph you should give the employer some very good detailed reasons why you would be the person for this job. Some examples are you should list your best qualifications, any experience you may have, and any specific things you want to point out, such as your availability. You should highlight how you learned your skills and characteristics for the position. You need to make this section of the cover letter all about showing the employer you meet every criteria on their job description, what skills you can offer, and you're the perfect candidate for this job. So how will you achieve this result? 1. Begin with a small introduction that is focused on your specific achievements, then compare these qualities to the job you're applying for showing you're a good match for this position. 3. Try keeping this paragraph excitable and impressionable, don't bore anyone. Don’t brag too much on one accomplishment, keep spelling them all out equally, coming across that all your accomplishments are equally important. 4. Use your final sentence with psychology, by repeating your job title and your company to enhance in their mind, so they will remember you when they put your letter down. ...As always, use every inch of this paragraph showing your skills and experience. This is the paragraph I would use that will let them know you are looking forward to an interview. Also you would be glad to be at their office at their convenience. Then mention your contact information with your telephone number that will get answered. Also point out your resume is more detailed and attached!! Don’t forget this most important part. Thank the person who is reading your cover letter. Don’t think about ending your cover letter by saying you that they will get in touch with you. So let them know the exact time and day, and also how you will contact them. When you make that statement, make sure you do it! Your creation possibilities are endless, your imagination is the key. The perfect cover letter in its closing paragraph would ideally state you are the one who will contact them at a future date and time. But I think it is also a great idea to even offer them another option. Contacting you!! The closing will also contain a final salutation, which there are many of. Sincerely, Respectfully, Best regards, Cordially, Thank you. Make your best choice and stay with it, let your personality guide you on this one. On a final note: Your resume and cover letter should both be printed on professional letterhead. A cover-letter closing paragraph should leave them with the idea that they really need to read your resume. 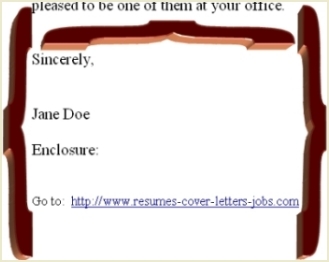 Almost all of our Resume Cover Letter Format samples on this website use four or 5 paragraphs. Take a look as you browse around our cover letters. It is all free, all the time, visit anytime you like. We are here for you 24-7. Always adding what you ask for and also many other helpful articles. I wish you the best.